PlayPower Canada offers a range of sensory playground equipment across Canada, designed to help you build the most inclusive playground possible. Sensory playground equipment engages all the senses, including auditory, visual, kinesthetic and others. For children with autism especially, sensory playground ideas and designs can be particularly beneficial thanks to cozier spaces that are designed to be soothing. If you’re looking for playground equipment to help you create a better play environment for children with autism, sensory playground equipment is ideal because it allows children of all abilities to play in an environment that is comfortable for them. It gives them an opportunity to break away from the noise and rowdiness of other children playing, allowing them to peacefully play on their own if they get overwhelmed. Sensory play equipment can be used by children with autism and those without, letting children play together or individually. Want to learn more about our sensory and Autism play equipment? Get a custom quote today! Playground equipment that stimulates auditory senses. Playground equipment that makes noise or music can be great for children with autism because it allows them to play creatively in a way that makes sense for them. Children stay in control and get to choose to make quieter sounds or individual sounds, which can be great for children who get overwhelmed with lots of noise. Playground equipment that stimulates visual senses. Bright colors and shapes as well as rounded edges and pleasing lines can appeal to someone with autism who is exploring the visual world at their own pace. Playground equipment with visual features can help a child with autism explore visual input. Playground equipment designed to appeal to kinesthetic senses. 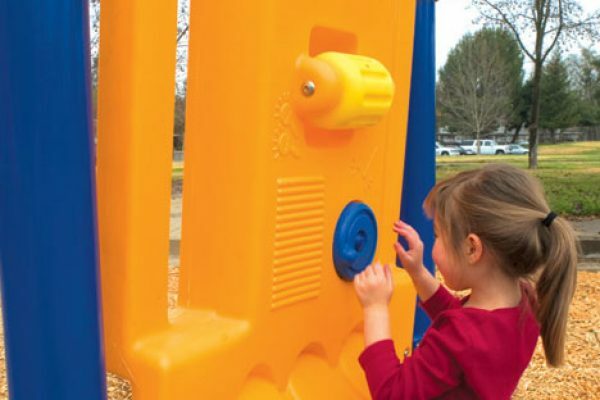 For children who find visual or auditory input overwhelming, kinesthetic designed playground equipment allows them to explore quietly through touch. Textured surfaces and equipment that moves can be soothing for a child with autism. For example, a swing or piece of equipment allows them to move slowly or rock can be very calming. Nature-based playground equipment. Playground equipment that mimics the natural world can be comforting to children of all ages and all abilities. For someone with autism, being able to sit under a quiet dome shaped like a rock can be an especially effective way to escape the sounds of a playground when they are feeling overwhelmed. Many traditional pieces of equipment are about excitement. Sensory-based equipment, on the other hand, can be about quietly exploring the world on one’s own terms. This is ideal for children with autism, who may be just as interested in exploring but may need a more nuanced and quiet way to do so. Sensory playground equipment offers just that. PlayPower Canada has many types of sensory play equipment, including activity panels, motion-based activities, quiet cozy spaces and more. For children of all abilities, ages and preferences, our playground equipment allows you to design the playground you’ve always wanted. Whether you want to create a playground for children living with autism or a playground where everyone feels included, contact PlayPower Canada to learn how to put together your ideal play space.